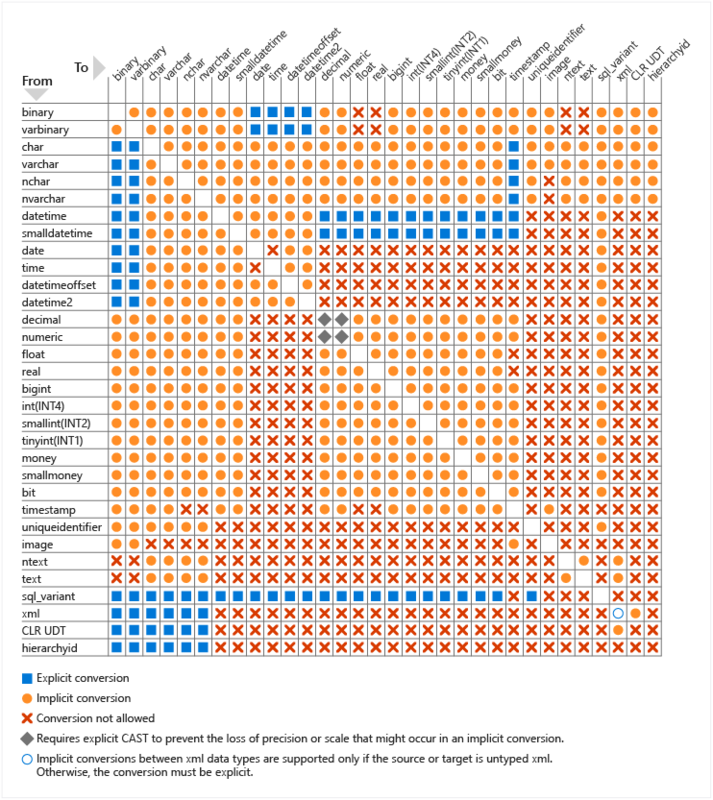 Are your indexes being thwarted by mismatched datatypes? Have you ever encountered a query that runs slowly, even though you’ve created indexes for it? There’s a few different reasons why this may happen. The one I see most frequently happens in the following scenario. You would expect this query to be blazing fast and use a clustered index seek, right? Why is SQL scanning the table when I added a clustered index on the column that I am filtering in my predicate? That’s not how it’s supposed to work! What is CONVERT_IMPLICIT doing? Well as it implies, it’s having to convert some data as it executes the query (as opposed to me having specified an explicit CAST() or CONVERT() function in my query). Who put numeric data into a string datatype? Someone who hasn’t had their coffee yet today. In my query however, I’m doing a comparison against a number WHERE Price < 6.75. SQL Server is saying it doesn’t know how to compare a string to a number, so it has to convert the VARCHAR string to a NUMERIC(3,2). Why? Because SQL is performing that implicit conversion to the numeric datatype for every single row in my table. Hence, it can’t seek using the index because it ends up having to scan the whole table to convert every record to a number first. That’s a lot of orange circles/implicit conversions! How can I query my coffee faster? Well in this scenario, we have two options. Fix the datatype of our table to align with the data actually being stored in this (data stewards love this). Not cause SQL Server to convert every row in the column. Since we do a comparison of equivalent datatypes, SQL Server doesn’t need to do any conversions and our index gets used. Woo-hoo! What about the rest of my server? Remember that chart above? 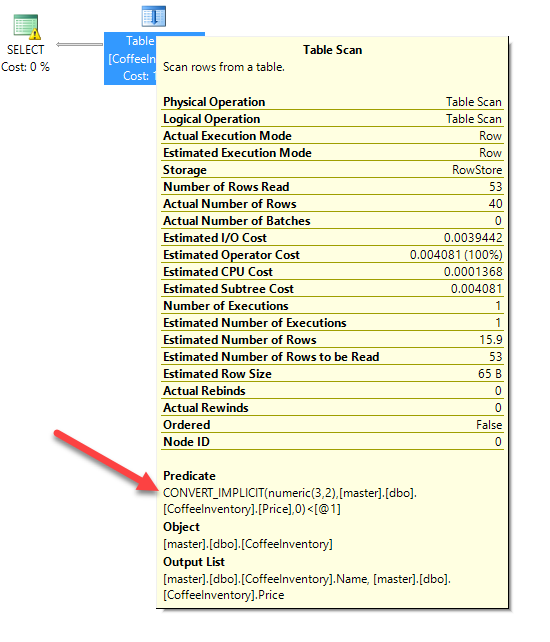 There are a lot of different data comparisons that can force a painful column side implicit conversion by SQL Server. 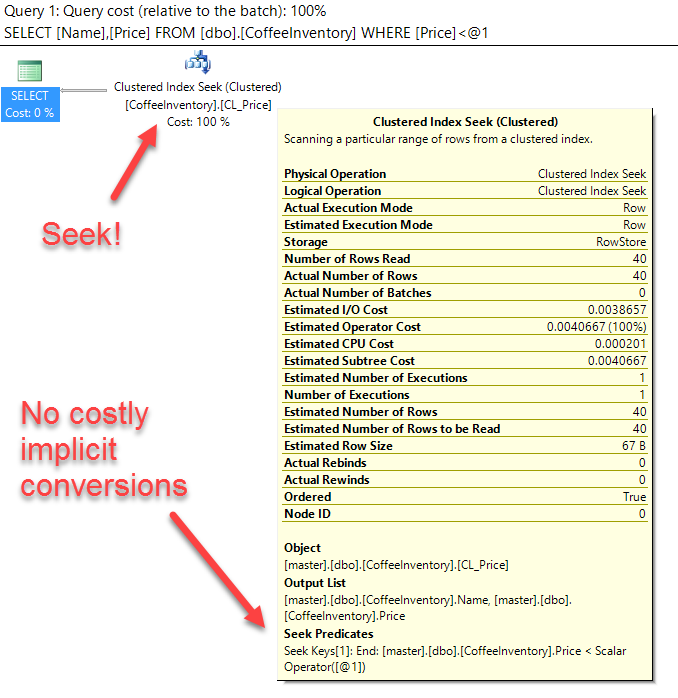 Fortunately, Jonathan Kehayias has written a great query that helps you find column side implicit conversions by querying the plan cache. Running his query is a great way to identify most of the implicit conversions happening in your queries so you can go back and fix them — and then rejoice in your improved query performance! This is great reminder and the chart really helps. Thank you!